Goldenrod Research, creator of the YouthTouch Technology Integration System, is pleased to announce its latest YouthTouch grant competition. 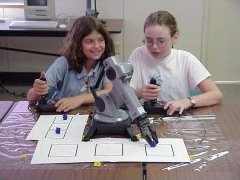 Our grant program provides an opportunity to affordably integrate hands-on robotics and fluid power technology into 3rd through 8th grade classrooms. Goldenrod will award 1:1 matching grants for use toward the purchase of YouthTouch. In exchange, the schools selected agree to serve as YouthTouch referral sites. Goldenrod regularly works with schools to coordinate matching funding from another source and cooperates to accommodate individual cash flow situations. Don't let money issues alone deter you from applying, if you are strongly interested. For your password to the grant seekers section of our website, including the application form, please fill the form below. Title: Miss. Ms. Mrs. Mr. Dr.